May I Thank You Very Much? Written on July 7, 2005, and categorized as Secret and Invisible. Thanks a lot everyone for the enquiries about health. 37 dead, 700 injured, BBC news at 6pm. Thankfully, me and mine safe. The streets are full of people walking home. 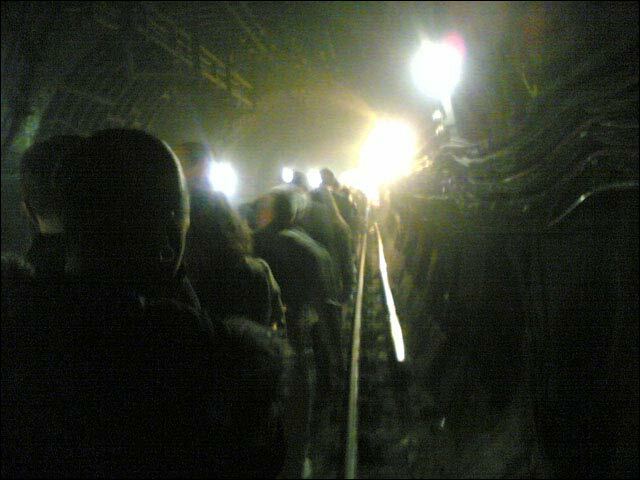 This amazing image is of people walking to safety along the underground tunnel near Kings Cross, where 21 died. Here’s the wizzy BBC graphic about the day, and here are some more photos from people on the ground. « Am I Still Alive? Glad to hear you’re okay Deek. Meant to post a comment the other day about the olympics stuff–as I think you know, we agree on this. Hang in there. Oh, Deek, oh, oh, oh. I can’t tell you how thankful I am to hear that you’re okay. Words are just failing me right now. I won’t say I know what you’re going through, but I will say that I think I have a nodding acquaintanceship with it. Dear friend, did I mention how thankful I am to hear that you’re okay? Just a random reader, but I am very glad that you and your family are safe. I am so saddened for all the families who were not to fortunate, and send them all my love this night. amazing graphics. London is my favorite city outside of New York (where I live) and Santa Monica (where I plan to live) and I have always looked to London for guidance in tragedies. Hope we can return the solace.